A symphony rehearsal: it's way more organized than real life. June 16, 2008, 11:18 PM · I sat down at orchestra rehearsal today, and I realized that this is one of the most blessedly easy things I do in life. It's so straightforward: in front of me sits the chart. I just play it. If I do everything requested on that page, I can leave the rehearsal reasonably satisfied that I've done a good job. And I love applying myself to the task: blocking the rest of life out and counting, watching the conductor, playing the right notes, nailing down every dynamic and nuance, hitting every entrance, and getting every articulation right. It takes concentration, and I'm happy to give it. Because the rest of my life is not so elegantly and beautifully defined as is my part in a symphony orchestra. Where's that chart telling me how to be a parent? Or the one that aims me the perfect direction in my career or finances? And even the directions I do receive point all over the place; they don't always end up making my life into noble music. And so I love my time in the orchestra chair. June 17, 2008 at 02:20 PM · Having a conductor makes a lot of difference. When was the last time anyone in your family or the world at large paid attention when you did the equivalent of signalling a downbeat. June 17, 2008 at 04:58 PM · I think it's the composer that makes the difference actually. It's all...orchestrated! June 18, 2008 at 12:51 AM · You would be surprised what can happen to composed music without the conductor. The musical version of "life is what happens when you are making other plans." June 18, 2008 at 04:21 AM · I think it takes the whole team to make it or break it. 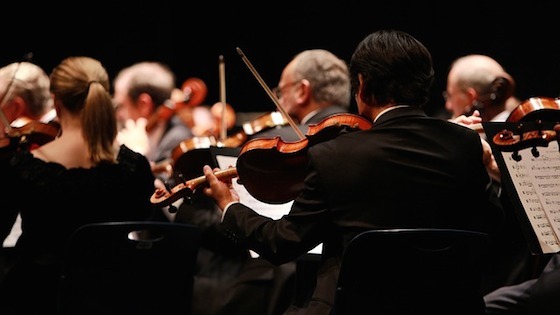 Having been one too many poorly skilled amateur groups myself, I can say neither great conductor nor fantastic concertmaster can make a week group to produce miracle. This is true to some extent in non-musical settings. A highly competent team needs no leader and a bad lead can ruin the best team, but then if you’ve hired a bunch of people ill-fitted for the job, you aren’t going to have a dream team no matter how hard you try. June 18, 2008 at 04:23 AM · Sorry for all the typos! Weak not week, leader not lead... Yikes! I wish I could edit in responding to a blog like in a discussion. Thank goodness for libraries and orchestras.